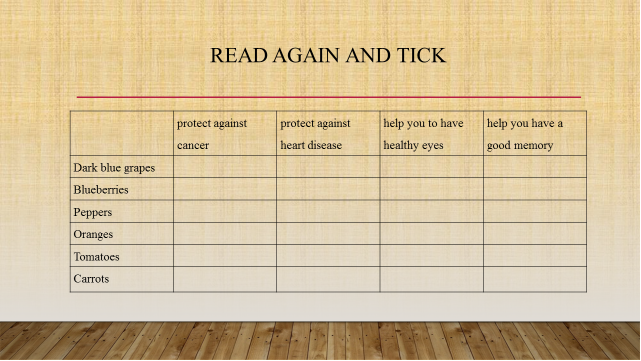 Aim: to introduce the topic of the lesson and activate pupils background knowledge. Teacher: Draw attention to the title of the lesson and tell me what you think this lesson is about. Pupils: Eating the right kind of food/healthy food. 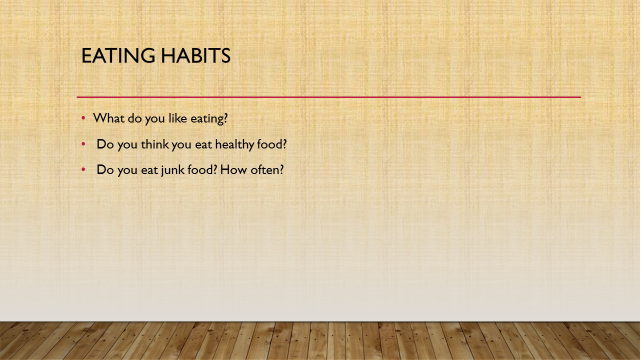 Ask pupils some questions about their eating habits. Teacher: What do you like eating? Do you think you eat healthy food? 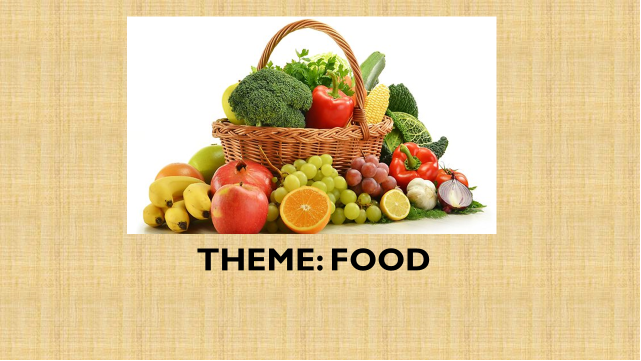 Aim: to introduce vocabulary related to vegetables in English. Teacher: Ask pupils to tell me if they know any vegetables in English. Look at the pictures of the vegetables and read through the words. 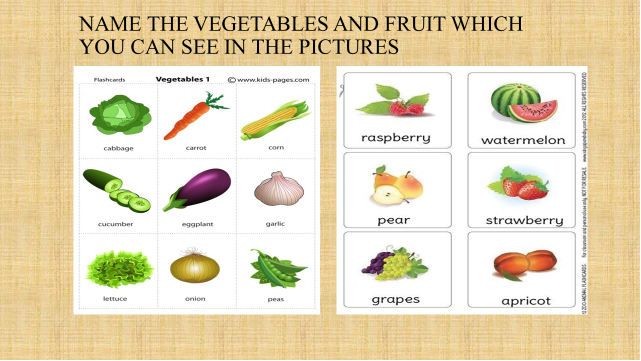 Help pupils deduce the meaning of any unknown vegetables by relating them to the context of the corresponding pictures. Follow the same procedure with the fruit. Play the CD and pause after each word so that students can repeat what they hear. Ask pupils the question in the rubric. Teacher: Which of the following do you like? Aim: to help pupils create expectations and make hypotheses about the article. to give pupils practice in identifying the main idea of the article. to present vocabulary. Structures and functions in the context of an article about fruit and vegetables. Teacher: Please, name the vegetables and fruit which you can see in the pictures. 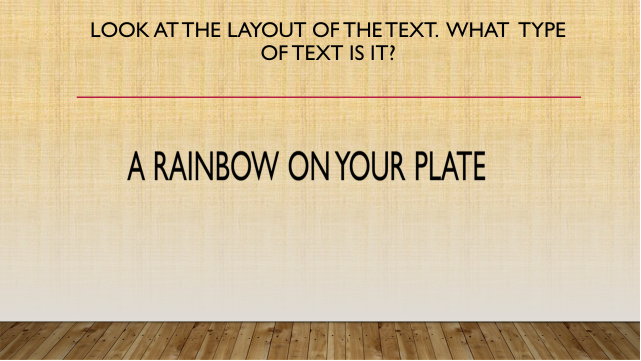 Teacher: Look at the layout of the text. What type of text is it? Teacher: Look at the title of the article. Draw pupils’ attention to the different colours of the letters that make up the word rainbow. Guess the meaning of the word rainbow? Pupils: An arch of different colours that appears in the sky when rain is falling and the sun is shining. Play the CD and have pupils read and listen at the same time. Teacher: Please, answer my questions. Teacher: How many meals a day should we eat? Teacher: Why are tomatoes and watermelon good for us? Pupils: They protect us against some types of cancer. Teacher: Are carrots rich in vitamin C? Pupils: No, they are not. They are rich in vitamin A. Teacher: Why are carrots good for us? Pupils: They help us have healthy eyes. Teacher: Why are oranges good for us? Pupils: They help keep our heart healthy. Teacher: Which green vegetables are mentioned in the text? Pupils: Spinach and green peppers. Teacher: How do they help us? Teacher: What do grapes and aubergines protect us against? Pupils: They protect us against some types of cancer and heart disease. Teacher: What do blueberries help us have? Aim: to give pupils practice in identifying specific information in the article. Teacher: Read the article and tick right answer. «Eat five meals a day, including lots of fruit and vegetables», nutritionists say. It’s important to include different kinds of fruit and vegetables in each meal. Try to make your meals colorful. It’s easy! Red fruit and vegetables, like tomatoes and watermelon, protect you against some types of cancer. Some others, like strawberries and red grapes, help keep your heart healthy. A and help you have healthy eyes. They also protect you against some types of cancer and heart disease. Citrus fruit, like oranges, aren’t rich in vitamin A, but they are rich in vitamin C and a type of B vitamin. They keep your heart healthy. Green fruit and vegetables, like spinach, green peppers and green apples, help keep both your eyes and heart healthy, and protect you against some types of cancer. Blue and purple fruit and vegetables, like grapes and aubergines, protect you against some types of cancer and heart disease. Blueberries also help you have a good memory. So, add a litter colour to your meals. Teacher: How many meals a day do you have? Do you eat lots vegetables and fruit? What else should we eat in order to protect our healthy? Aim: to present How much…? / How many…? and much/ many/ a lot of/ a few/ a little. 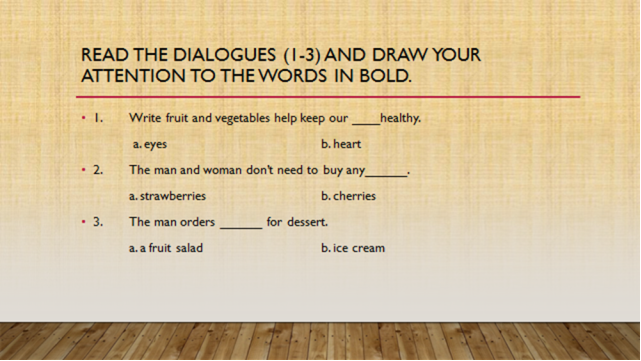 Teacher: Read the dialogues (1-3) and draw your attention to the words in bold. Have pupils do the activity then check the answers with the class. Read the dialogues below. Look at the words in bold and complete the table. A: How much fruit do you usually eat. B: I don’t eat much fruit. A: How many tomatoes do you need for the salad? B: I don’t need many tomatoes. A: Well, I usually eat a lot of / lots of tomatoes. A: Would you like a few peas in your salad? B: No thanks, but I’d like a little lemon juice on it. A: Me too, but I’d also like a lot of / lots of salt. B: It’s not good for you, you know. Pupils: Countable: How many, many, a few. Uncountable: How much, much, a little. Both: a lot of, lots of. Aim: to give pupils practice in using How much…? / How many…? and much/ many/ a lot of/ a few/ a little. Teacher: Circle the correct words. Drink a lot of / much water in the summer. It’s good for you. How much / many hours do you work every day? Let’s go! We don’t have much / many time. How much / many milk do you drink a day? A: We don’t have much / many vegetables in the fridge. B: Well, I can go to the supermarket and buy a little / a few carrots and some spinach. A: Do you want any salt on your salad? B: Just a little / a few. Teacher: Let’s check the answers. Teacher: Read through the sentences 1-3 and the options given. Make sure that pupils don’t have any unknown words. Teacher: Listen to the dialogues and complete the sentences. Chose a or b. Play the CD and pause after each dialogues for pupils to choose their answers. Play the second time and have pupils to check their answers. Listen to three short dialogues and complete the sentences. Choose a or b. Write fruit and vegetables help keep our ____healthy. The man and woman don’t need to buy any______. The man orders ______ for dessert. 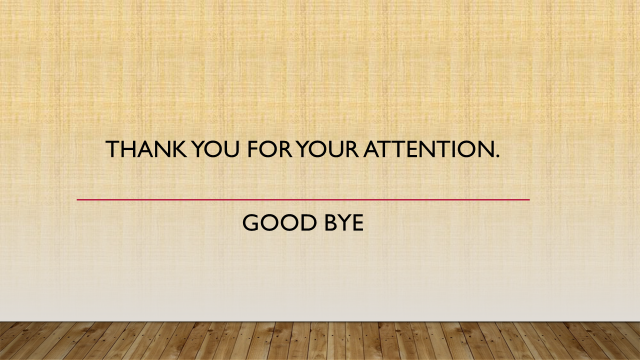 Presenter Back from the commercial break. We are here again with Dr. Joyce, the famous nutritionist. We’re talking about fruit and vegetables in our diet. Dr. Joyce And about colours on our plate. Presenter Well? Doctor, I really love eating mushrooms. Dr. Joyce Mushrooms? They sure are. They help protect against cancer you know and..
Presenter Are they good for the eyes? Dr. Joyce Well, not exactly, but they’re good for the heart. Presenter I see. Are they in the write group? John Ok/ Let me check the shopping list. Tomatoes, peppers, onions, ummm… what about fruit? John Yes, there are some in the fridge. John Oh, you’re right. Let’s buy some cherries then. Waiter Good evening, sir. What would you like to order? Man I’d like a garden salad and steak and chips for the main course. Waiter Splendid. Would you like something for dessert? Waiter We have delicious chocolate ice cream, chocolate cake and a fruit salad with six different kinds of fruit in it. Man I don’t really like chocolate. Waiter So, the fruit salad it is then? Waiter Would you like something to drink? Man Just some water. Thanks. Aim: to give pupils practice in talking about quantities of food. Teacher: Look at the pictures and read through the speech bubbles. In pairs discuss as in the example. 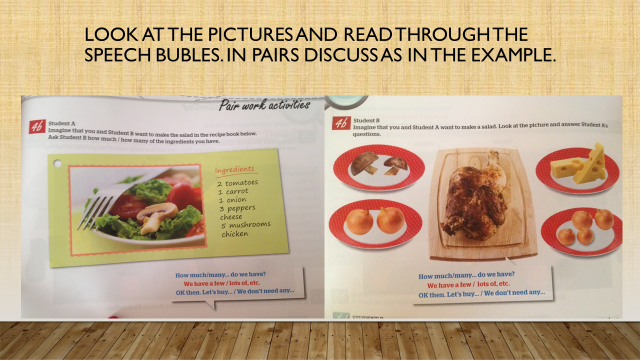 Task for pupil A: Imagine that you and pupil B want to make the salad in the recipe book below. Ask pupil B how much/yow many of the ingredients you have. How much/ many… do we have? We have a few/ lots of, etc. Ok then. 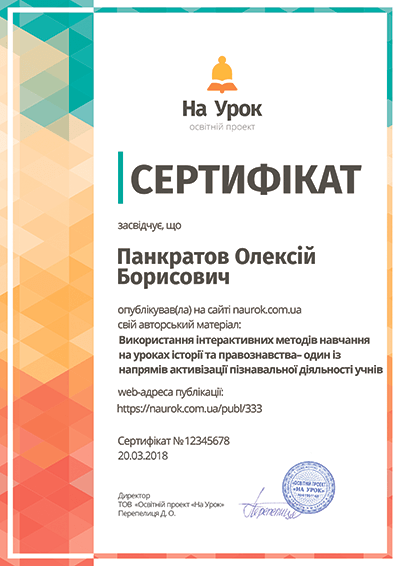 Let’s buy…/ We don’t need any. Task for pupil B: Imagine that you and pupil A want to make the salad. Look at the picture and answer Pupil A’s questions. Go round the class helping pupils when necessary. Choose some pairs to act out the dialogue.